If you are a wine connoisseur, Hardys shouldn't be a complete stranger in your "wine-tionary". 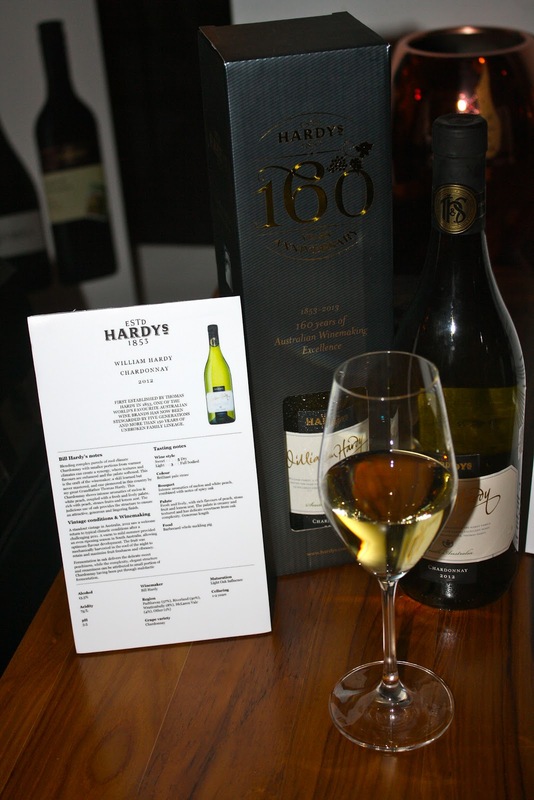 With 160 years of Australian winemaking excellence, Hardys is debuting three wines in Singapore (and hopefully more to come). The William Hardy range (William Hardy Shiraz and William Hardy Chardonnay) was launched last year to recognize Bill Hardy's 40 years as a winemaker and brand ambassador with the business founded by his great-great grandfather, Thomas Hardy. Honestly, the William Hardy Chardonnay 2012 was quite an acquired taste. The intense aromatics of melon and white peach, combined with notes of spicy oak wasn't something i quite enjoyed. Or to put it bluntly - a little too fruity for my liking. However, it paired well with the fish dish that was served with it. As compared to the Chardonnay, i preferred the Shiraz. The acidity of the wine in my opinion (i am no wine connoisseur by the way) was just right and it was good on its own and no doubt better when accompanied with the red meat. My favorite of the three however, had to be the 2008 Sir James Vintage Pinot Noir Chardonnay, which resembles champagne. The sparkling wine was undoubtedly also the favorite amongst everyone at the table and it was good on its own. With its rich nuances of lychee, butter sauteed mushroom and lanolin, it is one of the premium wines that make Hardys the biggest-selling wine brand in the United Kingdom. For now, the William Hardy Shiraz and William Hardy Chardonnay are available at Cold Storage and Jason's at SGD 37 a bottle. For that price honestly, i wouldn't dare complain or make any noise. The only thing i am complaining about is why isn't the 2008 Sir James Vintage Pinot Noir Chardonnay available yet - which also means from now till then, we will still have to pay the exorbitant amount for champagne, which taste similar to the 2008 Sir James Vintage Pinot Noir Chardonnay. So, the next time you have a party or if you are going to one, you won't be having to ransack the shelves of wine to find a bottle (or two). The Chardonnay chilled over a sunny afternoon, the Shiraz over dinner and of course, the Sir James for almost any occasion.